This week’s annual Summer FUN Show in Orlando will be the ideal event and location for dealers and collectors to combine business and vacation time with their families. This is always a popular show even though it is during the summer. The busy schedule will include a Heritage Auctions Signature Sale with their usual array of rarities that will surely please a large base of bidders. 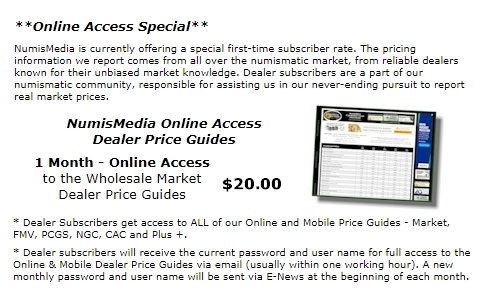 The sale will include some outstanding modern Lincoln Cents that will be quite significant to Registry cent collectors. Among the later Lincolns in this sale will be the highest certified 1936 S, 1947, 1949, 1950, 1951, 1952, and 1953 D. These are all blazing Red coins certified by PCGS. 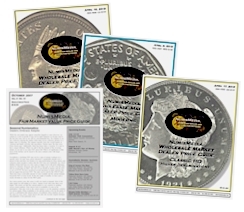 Many times these highest grade coins for the date will command dramatic premiums to the listed Market price. The competition is usually very intense and this sale should be no different. The following is a list of other potential highlights from this sale. While Gold is down slightly this morning, it has managed to hang around the $1,320 level. 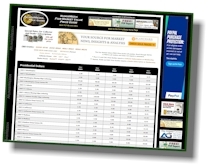 In this week’s Moderns Wholesale Market Dealer Price Guide the metals are markedly higher than the last issue, leading to a mass amount of increases in the bullion related charts. For example, the MS69 or PR69 $5 Gold Commemoratives have a minimum Market of $335 and Modern $10 Gold is at $665 for the same grades. As always, the lower grades have very tight spreads because of the metal content. Buffalo Gold is one of the most active modern issues along with American Gold Eagles. The minimum Market for the MS69 $50 Buffalo is $1,355 and the PR69 is at $1,390. In the American Eagles, the $50 Gold is $1,370 in MS69 and $1,545 in PR69.